As we get ready to leave Boston, people keep asking me if I have a Boston bucket list, the things I want to do – or do one last time – before we skip town for colder, more birch tree and lake filled climes. I don’t for the most part. My bucket list is really seeing people, the close friends or just the daily faces that are so familiar. It’s entirely expected that I’ll miss our dear, wonderful friends, our neighbors, my fellow doctoral students. I’ll miss them like the dickens. What is less expected, but is a realization creeping up on me is how much I will probably wind up missing the UPS man, the hip barristas at the local coffee shop, the sandwich crafting artistes at the cafe, the goofy kids at the cash register at the dog bakery (yes, there’s a dog bakery in our neighborhood), the fellow dog owners I wave at every day when I’m out with Squid, the old guy in the short shorts and helmet from the early ’80s who rides his bike everywhere all year round. These are the personalities, colors, faces, voices that make up what we have of community here. Also on my bucket list is simply keeping my eyes open to appreciate the daily sights here. We have a wonderful view from our apartment of lush tree tops and just the hints of skyscraper tops (Boston has all of 4 or 5 skyscrapers). It’s Boston, so there are truly historic sites tucked in here and there and everywhere amidst daily life. The trees and vines, flowers and bushes of the arboretum look like fairyscapes right now, so I’m trying to remember to breathe them in amidst the frenzy of everything else going on. And, no surprise, there is a bit of a food bucket list. We’re making quick runs to our favorite farm stands, an unhealthy number of stops at our favorite bakeries and ice cream shop, and by the end of next week, we’ll probably be floating away on a river of really excellent iced coffee. Most exciting of all (well, maybe not of all, but it was definitely exciting), we finally went on a hot date to a rather fancy restaurant that we’ve been daydreaming about trying for a while. For all my interest in food and reading of restaurant reviews in the Times, I have been to very few seriously fine dining establishments (approximately zero, before this). I’ve been a grad student for a while, and all! So, though I love the idea of it, I’m completely intimidated by fancy restaurants, and we probably would not have wound up going in the end had Joel’s aunt and uncle not brilliantly and generously given us a gift certificate as a birthday present. Yippee! It was time for an eating out adventure. (And yes, I was totally nervous that I was going to make like Julia Roberts in Pretty Woman and go flinging escargot all over the restaurant and feel like a doofus. Luckily, I did not.) The meal was spectacular. Many things involving brioche, and squash blossoms, and caviar, and figs, and quail, and such. It was also the type of meal that begins and ends with a flurry of tiny tastes, each one a burst of intriguing flavors in your mouth, carried out in boxes filled with rice or on platters lined with smooth rocks. Oh how I love flurries of small plates! The savory madeleines with caviar were stunning, and we threatened never to leave after we tried the guava caramels. And everything was so pretty. Ever since my own escapades with plating for my Norwegian Independence Day celebration this year, I’ve been more and more intrigued by beautiful plating and what it adds to a dish. Another dimension, that’s what. You eat with your eyes as well, after all, and while a dish can be gorgeous and delicious without being made to look as though it were a trail of flowers and jewels next to your perfectly seared piece of fish, it can also be awfully fun to eat one that does. It’s simply a different way of being transported. The food reminded me a bit of the eye candy that I study in my, now well-thumbed, copy of The Eleven Madison Park cookbook, (I treat it like a picture book, gazing at the images like I used to gaze at fairytale picture books when I was little. Some things never change!) so that was the cookbook I turned to when the same aunt and uncle who gave us the gift certificate came over for dinner this weekend. And looking through the cookbook, I was reminded again that I probably will never make the majority of the food in there, save the strawberry gazpacho. I could still be inspired though! I wanted the meal I cooked for them to be more home style on the whole, but I also wanted to start it with, perhaps not a full flurry, but at least a small assortment of little bites, and in my search for suitable options my eye fell on some black pepper sables with crispy squash blossoms and shaved zucchini. I didn’t have access to any squash blossoms unless I pillaged from neighboring plots in our community garden, and I was thrown off balance by the sable recipe’s demand for 8 hard cooked egg yolks and several sticks of butter for only a tiny amount of flour. 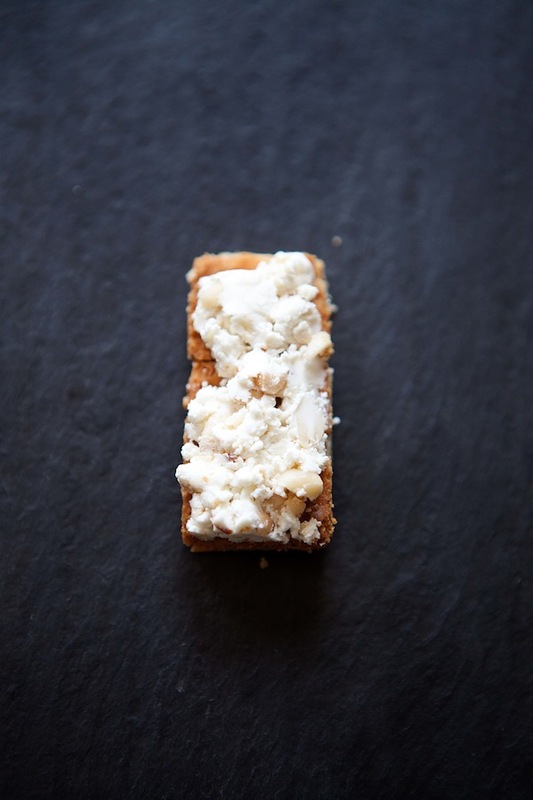 So, I decided to save that for another day, but to take the general idea – buttery, crumbly crackers with the heat of fresh black pepper, coated with a layer of chevre and toasted pine nuts, and finished with the light green flavor of paper thin summer squash – and make it my own. Instead of sables, I made a tender black pepper shortbread. 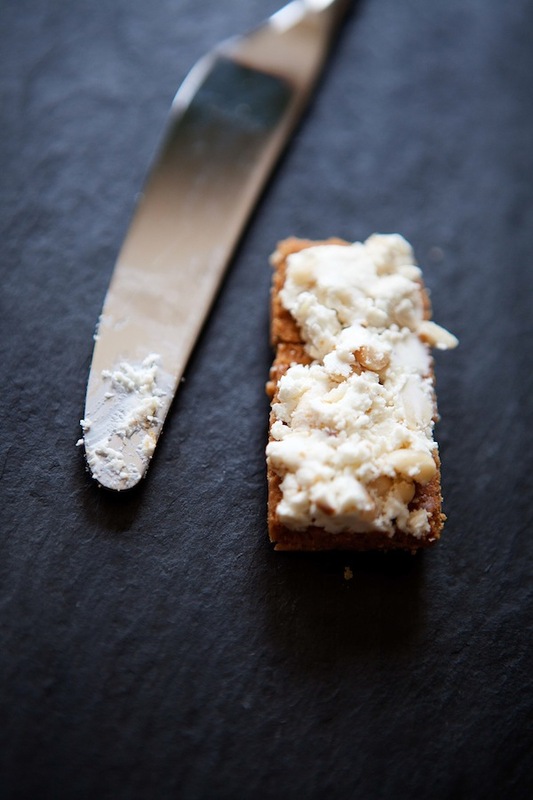 I used the same blend of goat cheese and pine nuts – why would you ever change a combination of goat cheese and pine nuts? And instead of deep fried squash blossoms and blanched zucchini, I thinly sliced pieces of zucchini and summer squash and left them in a bath of lemon, olive oil, and mint to tenderize their chewiness while sharpening their flavor. My brilliant decorative flourish was to roll some of the pieces of squash instead of just stacking the slices, thereby creating a somewhat similar sense of texture and structure (at least in the look) as a squash blossom would have. Oh yes. This is actually a fine dining establishment in disguise with such complicated plating skills as rolling being broken out. Seriously though, I would raise no objection to being served one of these as part of a meal that was costing, erm let’s not actually talk about fancy restaurant costs…of a very classy meal. In fact, they would fit right in with flavor and looks, but they’re remarkably easy to make, which checks all the boxes on another bucket list of sorts. And, of course, I cannot close without mentioning that force in the kitchen, Julia Child, who would have been 100 today. Everything I’ve ever seen about her, or of her makes me believe she was a truly remarkable person and an admirable role model for how to live passionately. We would all do well to aspire to be like her in attitude and energy. And use just as much cream and butter. In honor of her, I’m sharing two links celebrating Julia that I found especially lovely: A remix (yes, seriously, a remix) of some Julia-isms and a wonderful article about her and how she translates for the home cook. I like to think she’d enjoy buttery shortbread topped with courgettes. In a small bowl, beat together the butter and powdered sugar with a wooden spoon until well combined and a bit lightened in color. Add the salt and pepper and stir well. Then, add the flour and stir just until combined. Gather the dough together into a ball and pat it into a thick rectangle. Cover with plastic wrap and refrigerate for at least an hour. Preheat your oven to 325F. Take the dough out of the refrigerator. Thump it a bit with a rolling pin to get it a little soft, then roll it out into a rectangle that’s about 1/4 inch thick. Using a sharp knife, cut the rectangle into 12-14 smaller rectangles. 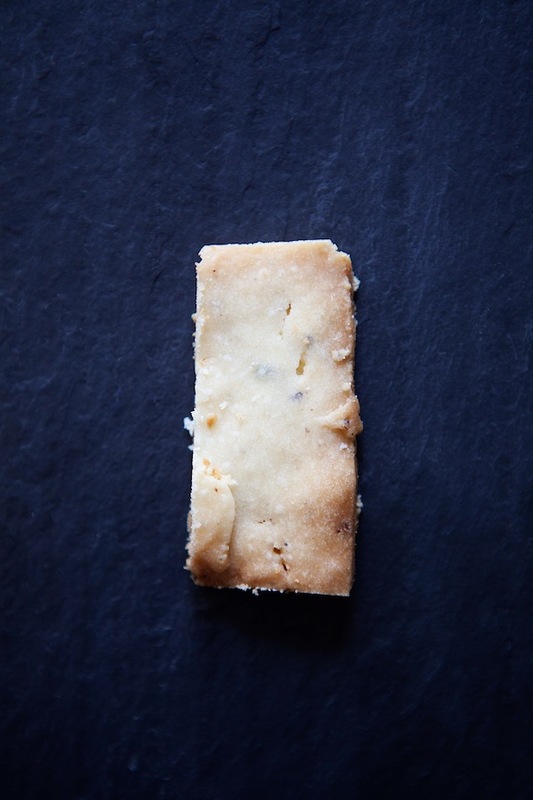 Transfer the shortbread rectangles to the baking sheet and bake until light golden and slightly darkened around the edges, about 20 minutes. Remove from the oven, transfer to a cooling rack and cool completely. 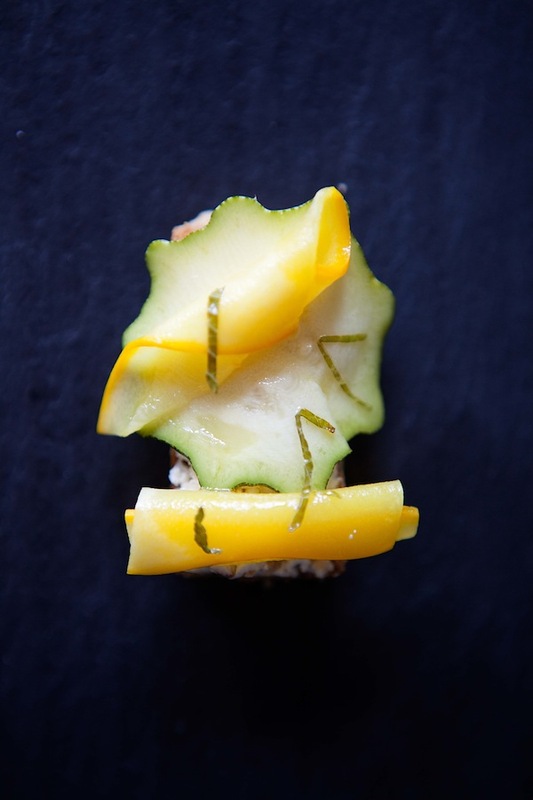 Using a mandoline or a sharp knife, slice the zucchini and summer squash into very thin pieces. You can slice one across and one on the diagonal to get variety in the shape of the slices. In a medium bowl, toss the squash and zucchini slices with the olive oil, lemon juice, mint leaves and a sprinkling of salt. Cover and refrigerate for at least 3 hours. Spread the pine nuts in a baking dish and bake them in the oven at 375F, stirring occasionally, until golden and fragrant, usually about 5-7 minutes. Cool, then chop finely. Allow the chevre to come to room temperature, then stir in the pine nuts, taste and add salt if desired. Spread each of the shortbreads with a layer of the pine nut and cheese mixture. Top with several slices of marinated summer squash. You can simply stack on the pieces of summer squash, or you can roll or fold some of them for a more interesting visual effect. Wow beautiful photos! This appetizer is so exquisite. Well done. I too have enjoyed thumbing through the Eleven Park cookbook though I have so far only made the white truffle ice cream (good place to start though). Lovely photos and story! The white truffle ice cream, eh? Thanks for the tip! I’ve definitely been keeping my eye on a bunch of the basic sauce, puree, and ice cream recipes as things to turn to and try out. Yeah, I was trying to remake a white truffle float I had had at a restaurant. Good stuff! That cookbook sounds fancier than the restaurant you went to – Aspirational with a capital A! But, your extreme tweak of their sable idea looks much better than their recipe sounds, so bravo. And your photos are really stunning. I love their simplicity, especially because it is an antidote to the fiddly frou frou-y styling that one often sees these days with their acres of cloths and antique this and thats. Btw, any hints as to how you achieved your light on dark photos? It’s a pretty darn fancy cookbook! 🙂 And, thanks so much for the compliment on the photos. I totally agree that so many photos are overstyled, though it can also be awfully fun to play with linens and silverware from time to time. For the light in the dark photos, I often shoot in a place that’s lower light and try to place the food where just a little extra light catches it, or I try to create shade on some of the background to make it darker. I do also adjust the contrast a bit, increasing it, when I process the photos, which helps brighten up the colors. Hope that helps! Thank you! They were extremely tasty. 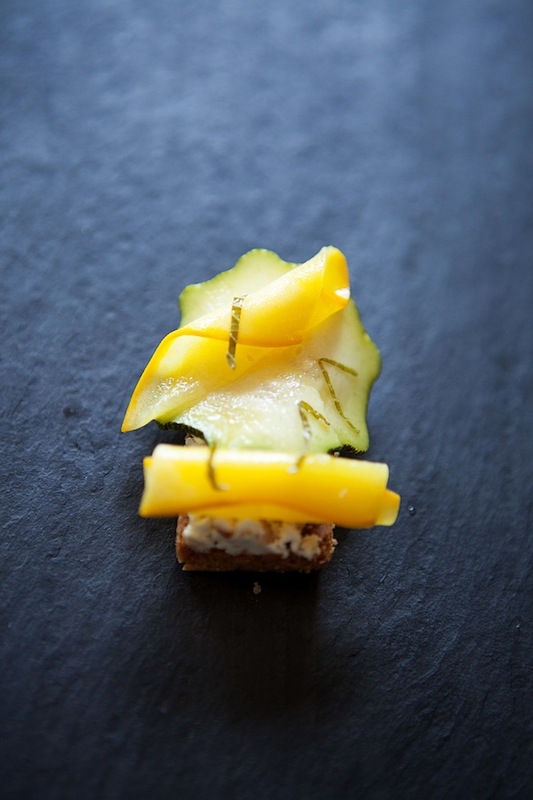 You are currently reading Black pepper shortbread with chevre, pine nuts, and marinated summer squash at Five And Spice.